A 26-country survey published on Monday found that a majority of countries see climate change "as the top international threat." Terrorism, especially the kind perpetrated by the "Islamic State" militant group, came up as the second-highest threat, topping security concerns in eight of the countries surveyed in the Pew Research Center study. WNU Editor: The PEW study is here .... 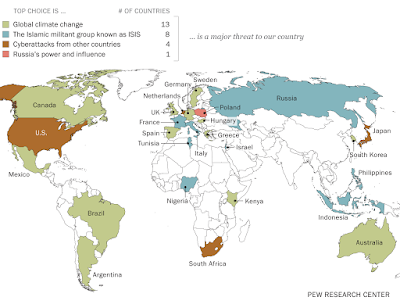 Climate Change Still Seen as the Top Global Threat, but Cyberattacks a Rising Concern (PEW Research). Mostly it is western Europeans, Australia and Canada, the wealthy white world that sees Climate change as a top threat. The Asian, black and brown world not so much. Yet they are supposedly suffering from it. Back in the real world, the USA ought to note the number of so called allies that sees the USA as the greatest threat in the world, then react accordingly with our NATO friends.